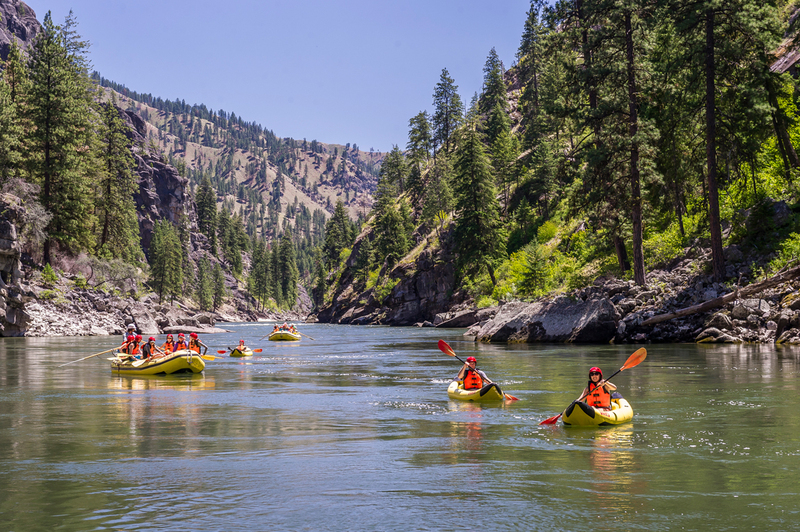 Around 4 p.m. on a perfect July day, my sons ‘SUP’ed into our riverside camp along the Main Salmon River, the sun beating down on their shoulders and the pleasantly warm water lapping their toes. 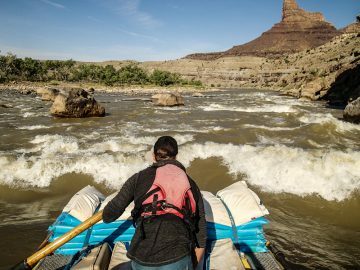 My 16-year-old kneeled in front by the bow as my 13-year-old navigated into the eddy from his position standing behind, the blue sky framing his face. I watched as they worked together in precious sibling harmony from my vantage point at the front of the adjacent paddle raft, while their grandpa, my dad, captured the moment on his Nikon from the relatively splash-free safety of the back of an oar boat. “Can we paddle around the eddy more?” the boys called to our team leader, Diego, as our convoy of rafts—including the SUP, paddle raft, several supply oar boats, inflatable kayaks (or ‘duckies’), and a fiberglass dory—pulled into the sandy shore. Remarkably, despite having been on the SUP most of the afternoon, they still wanted more. When we booked our Main Salmon river trip, we looked forward to experiencing the range of options afforded to guests when it came to transportation on the river. As a multigenerational family group comprised of teens, a parent, and a grandparent, we assumed our choices would naturally gravitate toward the adventurous or tame in correlation to our ages and experience levels. Instead, we found our preferences depended only on the day, the whitewater in store, and our ever-changing idea of fun. 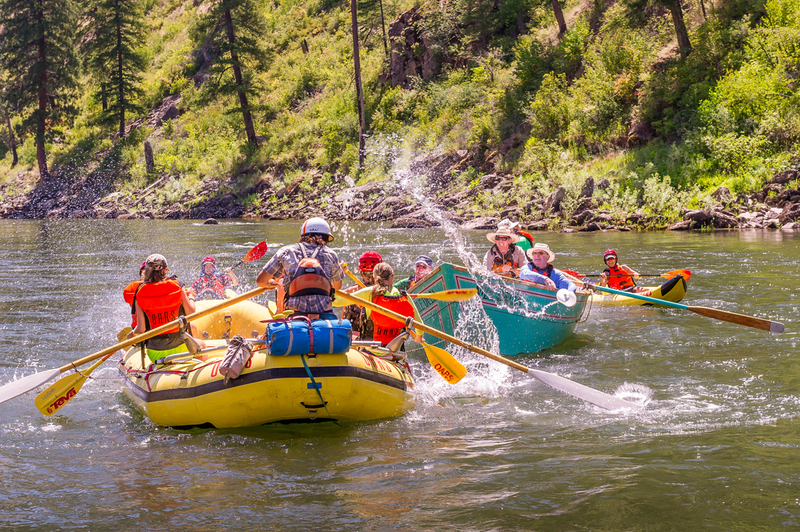 Everyone on our trip seemed to have a favorite raft or boat—one couple loved the dory, and another mom picked the paddle raft just about every time—but like the case of our family, most preferences changed daily. 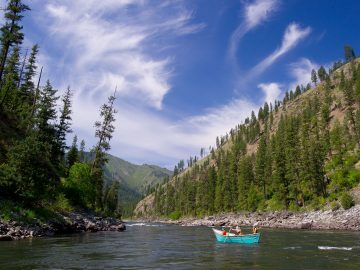 On flat water, my 65-year-old dad enjoyed paddling a ducky, while I preferred to lounge back on a gear boat and close my eyes against the sunshine, my back resting comfortably against the gear bags. 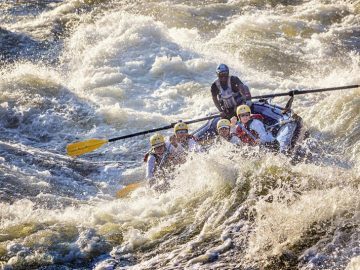 On tamer whitewater, I joined ‘team ducky’, getting plenty of excitement from Class I-III rapids, while my dad hopped over to a gear boat to capture video or spot wildlife without needing to row. The teens jumped into the dory for these moments, loving the way the buoyant boat rolled over wave caps like on a roller coaster. On big water, I gravitated toward the paddle raft, which led the duckies through each rapid, giving me a great vantage point to turn back and capture the teens’ triumph (or swimming session) through difficult rapids with my waterproof camera. When the late afternoon sun beat down and the wind picked up in the canyons of the Salmon River, the teens tended to depart the duckies for the fun of the paddle boat, where they could jump off the sides for a swim or engage in “paddle challenges,” linking their paddle T-grips and leaning back toward the emerald green water until they fell, laughing. 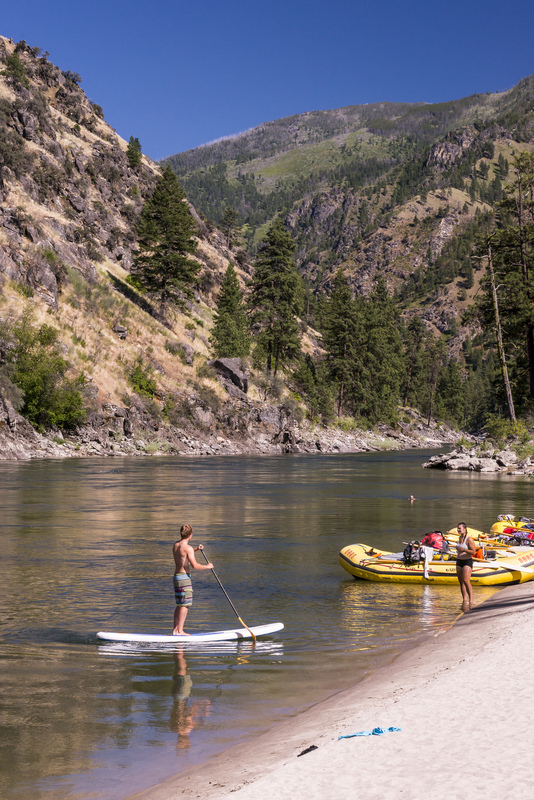 The SUP served as an additional lesson in balance when riffles broke the surface of the river. As we all floated, we formed a loose snake of yellow rafts drifting and rolling down the Salmon. And as for that sunny afternoon my sons paddled into camp asking to continue playing on the paddle board? One of our guides took the request one step further. “Think you can fit seven on that SUP?” she asked with a grin. As it turned out, no, they could not, but that didn’t stop everyone, from the college-aged guides to the teens to the parents, from trying.